What if you had an extra $200 to spend on your home? Would you rather spend it on door knobs or something more exciting like shiplap or windmill wall art? 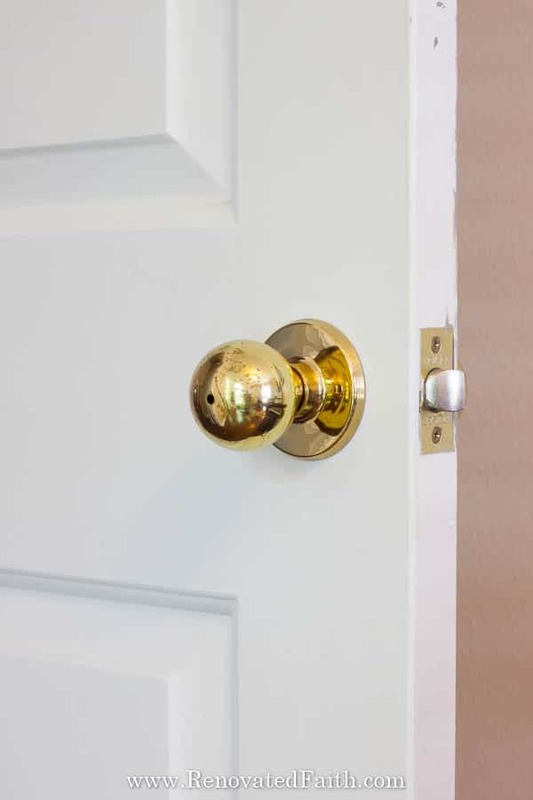 Refinishing old door hardware makes a huge impact in updating the look and feel of your home. 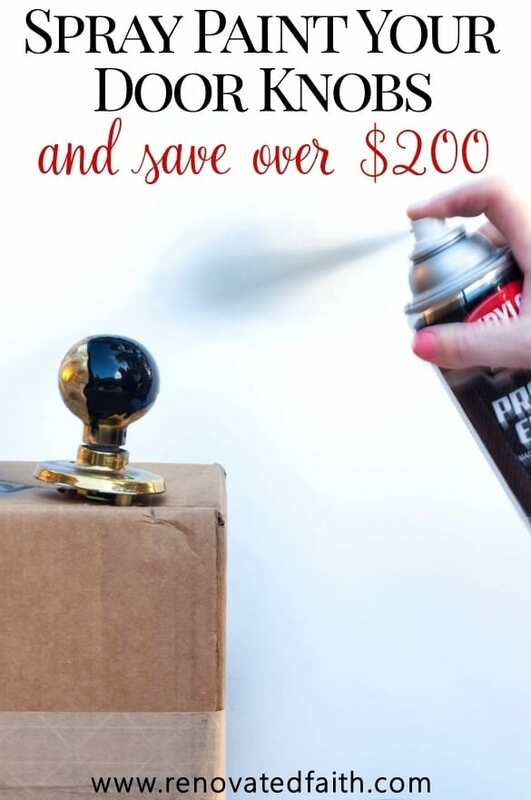 With this tutorial, I show you how to spray paint door knobs that last and instantly save you money! 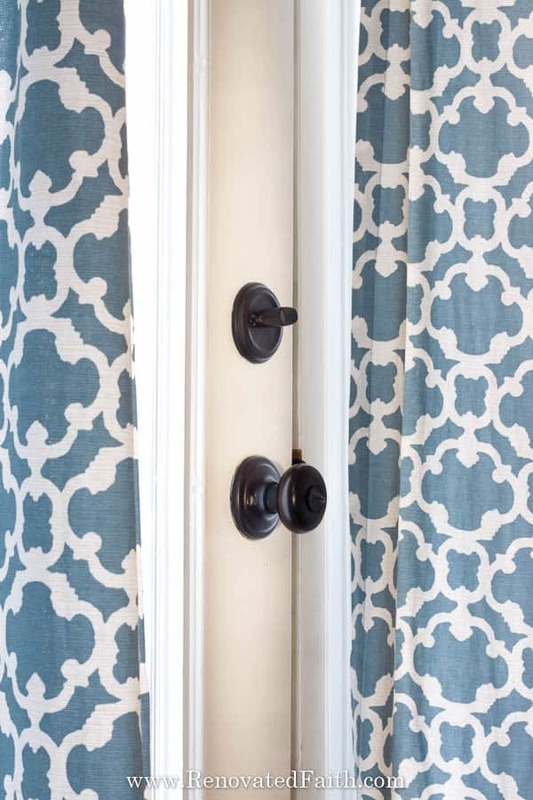 DIY: Spray Paint Door Knobs….or Buy New? When we first moved into our house a few years ago, I looked into buying new door knobs for the whole house to replace the old brass door knobs. Here is how they looked before painting. 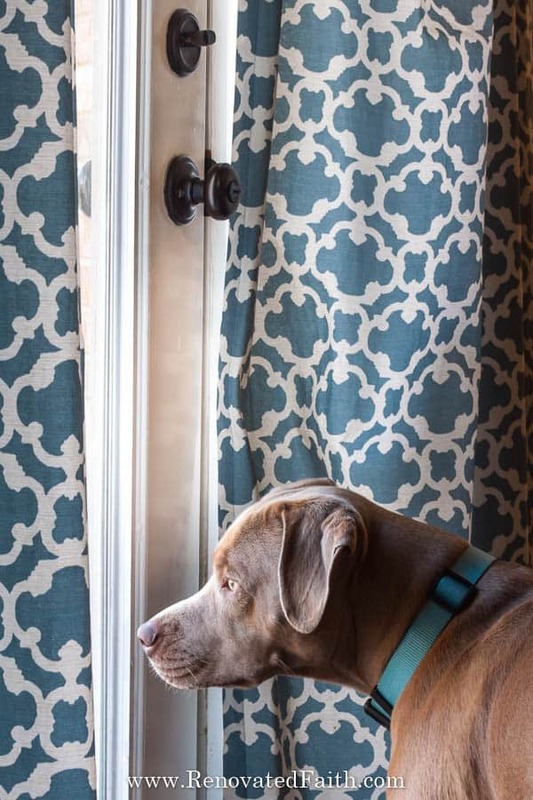 I compiled my list and went to Home Depot only to realize that new door knobs, hinges and strike plates would cost me well over $200 – money that could be better spent elsewhere in our tight home budget. There are definitely those projects where it’s smarter to buy instead of DIY, but this wasn’t one of them! It was then I decided the best option would be to spray paint door knobs throughout the whole house. To cut costs and stay on budget, I opted to spray paint the door knobs on the exterior doors using this same process a few years ago. They still look great so I’ll be using the same process in refinishing the old door hardware through the rest of the home! That’s a significant savings and money I’d much rather put toward more exciting items on our home to do list. Does spray painting door knobs last? Like I mentioned, I spray painted the entry door hardware in our house when we first moved in a few years ago, because those were in the worst shape. 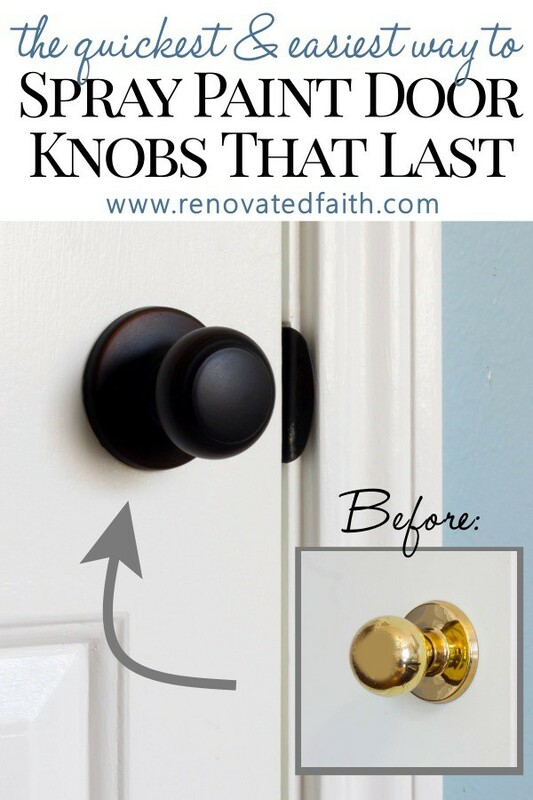 In those few years, they have held up beautifully and now that I’ve tested out this process, I recently finished refinishing the old door hardware in the rest of the house! “Can you spray paint hinges on doors?” A couple of you have asked me this question and while you probably can, I don’t think I’d recommend painting hinges on doors. I would be concerned about the constant forceful motion of the hinges eventually rubbing the paint off. So since hinges are cheap (if you get them in a set here), I opted to buy those and I’m so glad I did! This saved me from some extra work and the possibility of having to repaint or replace them later on if the paint chipped! Also, I decided to buy new strike plates that were already oil-rubbed bronze because I knew they would be much more likely to get scratched – hence the name! These were very cheap online here. Automotive Primer – I used this and bought it at Lowe’s. 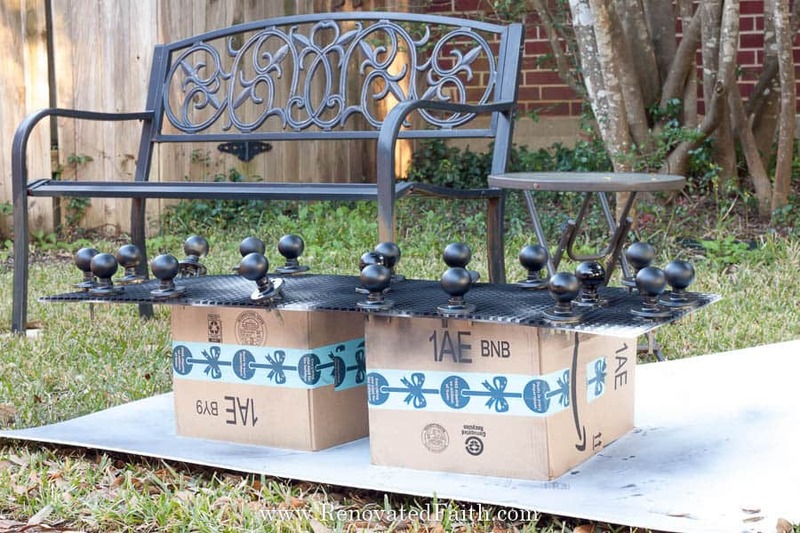 Rustoleum Universal Oil Rubbed Bronze Spray Paint – I love this brand and you can get it at any home improvement store. Sander – Here is a favorite of mine at less than $17 and you can see my sander buying guide here. TSP Cleaner (optional) – I keep this on hand. You can get it at any home improvement store. Oil-Rubbed Bronze Hinges – These are the standard size that fit most doors and have had good experience with them. (See the current price here). Painter’s Tape – Get the wider size like this. Remove the hardware with a screwdriver. I used a piece of painter’s tape to label which set of knobs went with which door. Removing the door knobs will take a little while so I used the time to listen to one of my favorite podcasts. 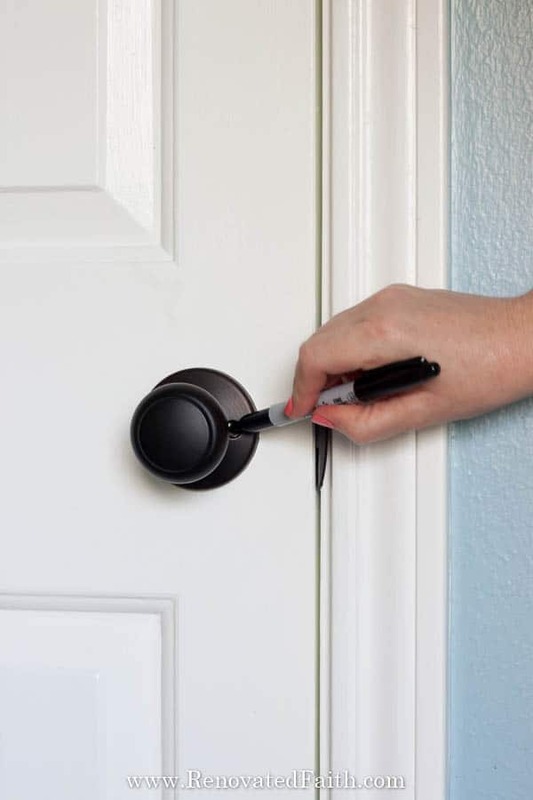 Can you Spray Door Knobs without Removing Them? A reader asked if you can spray paint door knobs without removing them and while it is tempting, just take them all off to spray paint! You can see here where I spray painted my shower using the same process and the results were amazing but even though I taped off every bit off our bathroom, there was still over-spray on our master closet shelves over 12 feet away. Just don’t risk it! Notice I taped that part that goes into the wall because it will more than likely get scratched up anyway. That part is called the throw latch and yes, I had to look that up! Here is a video that shows you how I went about this whole process including how to sand them. This saved me so much time! You’ll noticed some etched places on the door knob. These marks are not deep so the surface will still be smooth after they are spray painted. You are going to wipe off the hardware after sanding anyway, so you might as well wipe it off with something that will remove any grease or grime that would prevent the paint from sticking. I mixed some tsp with water in a spray bottle according to the package directions and just wiped them clean. 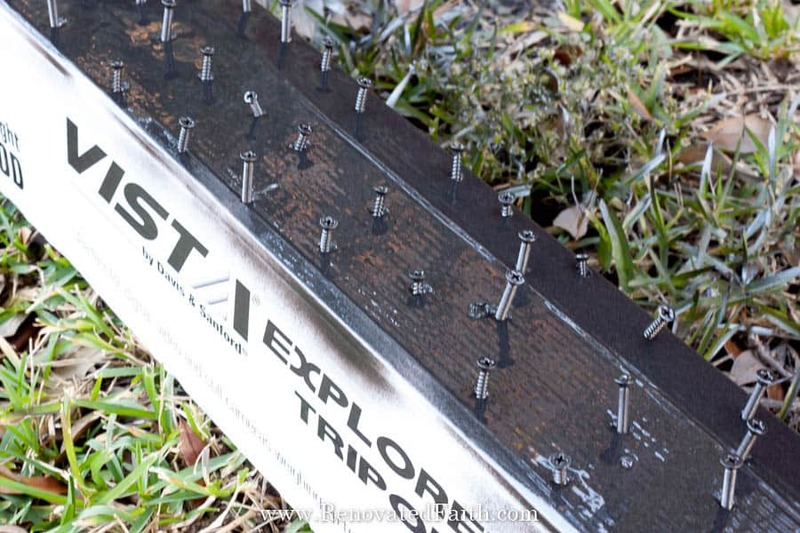 This step is optional but it will definitely help to ensure your paint sticks. 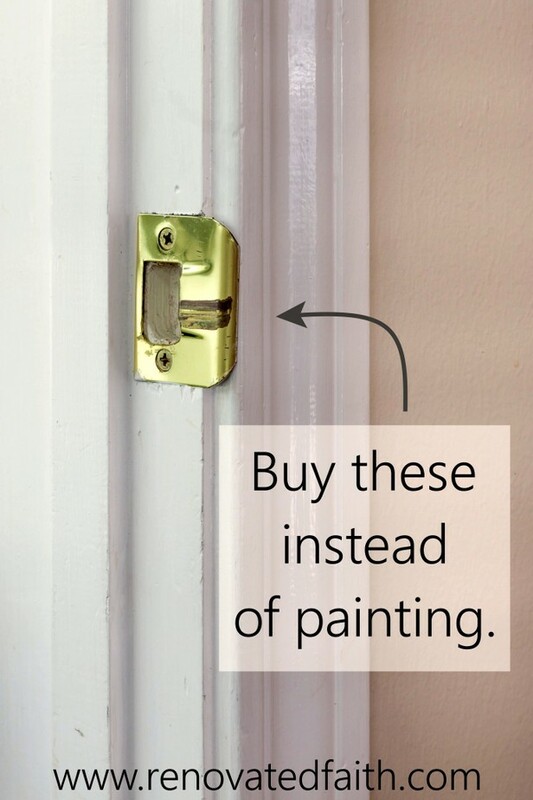 If you are refinishing old door hardware as a means to update your house for a quick sell, you can check out one of my most popular posts. In it, I describe 25+ updates for selling your home fast and a printable home staging checklist. Yes, I get it! But for this project we want MAXIMUM adhesion so you want to take the extra step of using automotive primer so the paint really sticks to the door knob. The automotive primer is a much more heavy-duty version or regular primer. Be sure to shake the can well and spray the surface lightly. This is one of the few times that a little is better than a lot. I used boxes and some egg crate material I had on-hand to hold the door knobs in plate. (You can get egg crate material at any home improvement store but styrofoam or old boxes are a cheaper option). Don’t forget to spray the underside part of the knob. Check the back of your can for the re-coat time. Mine said to re-coat in less than 2 hours or to wait past 48 hours. So, I waited about 30 minutes to spray paint the door knobs. The best spray paint for door knobs or cabinets is Rustoleum Universal Metallics. They have a really nice durable finish and I’ve used this brand time after time with no complaints. I chose the Oil-Rubbed Bronze finish but you could also do matte black, satin nickel or a champagne gold color. There are so many options in this line to choose from. I spray painted the inside hardware on a paper plate. I stuck the screws in a box in order to spray paint the tops. If you are new to spray paint, no worries, my friend! This paint and color is one of the easiest to work with! Just spray on a light coat and then wait about 30 minutes and do another light coat to finish up. Let them dry for 3 days. Trust me, it will be worth it! Now is a good time to replace your old hinges and strike plates while waiting for the door knobs to dry. As I mentioned earlier in the post, these are parts of the hardware that are far more likely to be scratched. Since strike plates and hinges are both cheap, we are going to buy new ones. 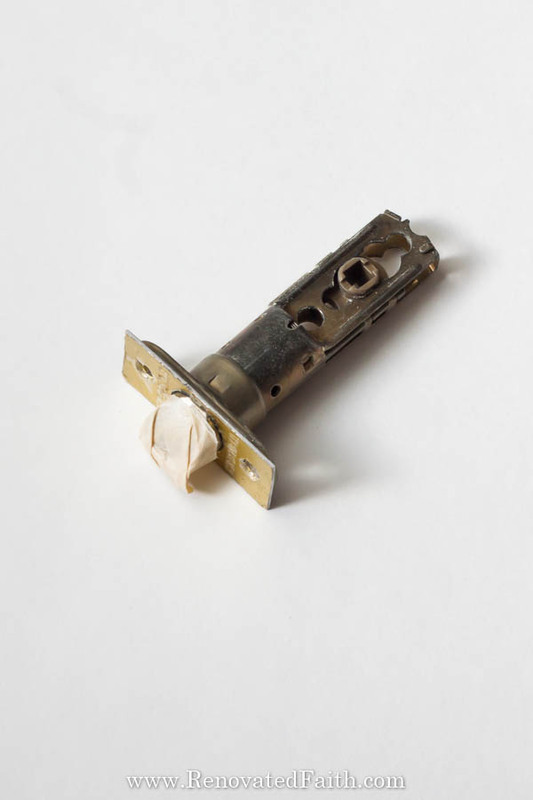 For the hinges, you want to be sure to replace one at a time. Take one off, replace it and tighten it and then replace the others one at a time. I say this because on our master bedroom makeover, I took off the door to paint and I still can’t get that door balanced quite right. So, it now stays half-open most of the time. It kind of drives me crazy! Fortunately, I just bought these magnetic door stops which will solve that problem! I reinstalled the door hardware being careful to not scratch the knobs as I screwed them in. I put a piece of painter’s tape around each knob to ensure this wouldn’t happen. 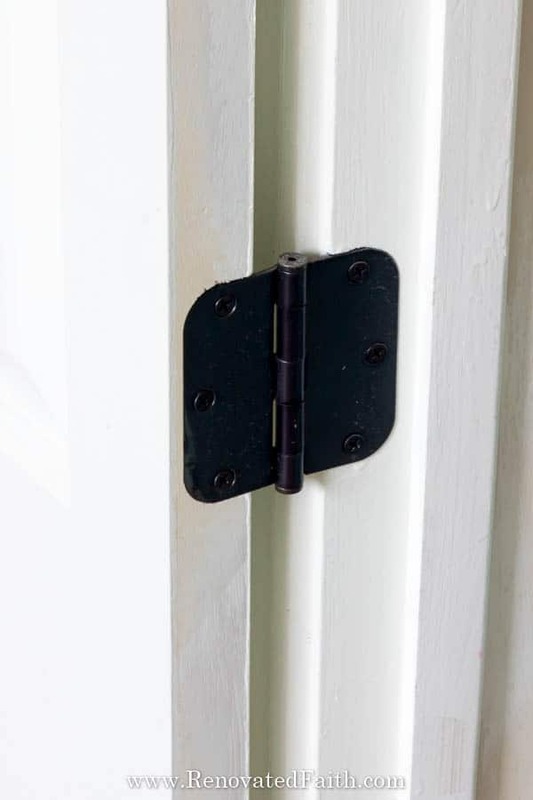 After refinishing your old door hardware, you might notice that some of the paint in the middle of the screw heads might have come off when you installed them. You can just touch up those centers with a sharpie! 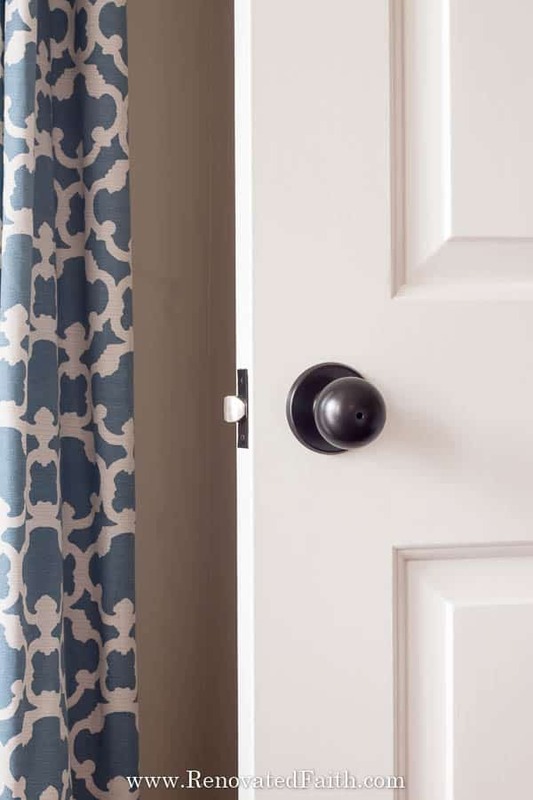 If you decide to buy door knobs instead of replacing them, here are some options online. Can you paint brass hardware? Most of the hardware on our doors is metal with a synthetic brass coating. However, someone asked me if you can paint brass hardware. 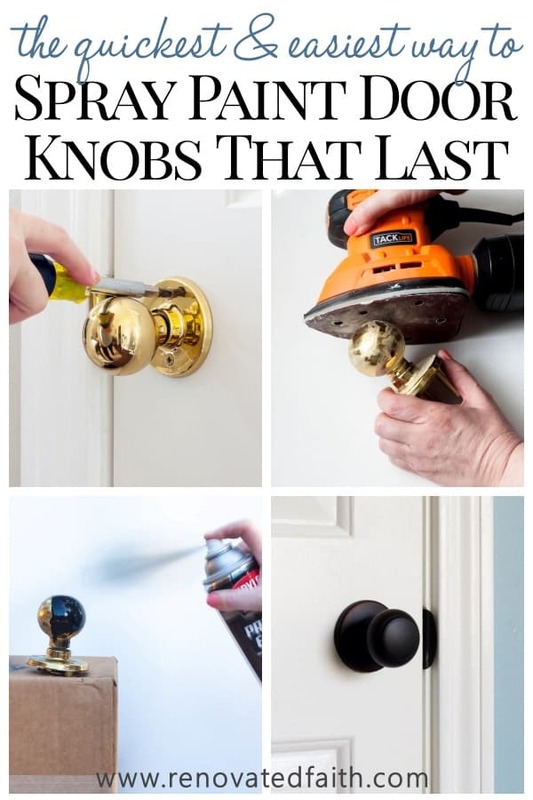 You can absolutely use this same process for refinishing brass doorknobs but I would still buy new hinges. I asked this same question when refinishing my door hardware and it is really up to you. There is no hard and fast rule that door knobs should match hinges but it does look nice. Some door hinges are hardly noticeable so you might choose to leave those and replace the ones that are more noticeable. Does spray painting door hinges last? Like I said, spray paint door hinges doesn’t usually last as I’ve seen this on the kitchen cabinet hinges from our old house. Just bite the bullet and replace them with new. Fortunately, they are cheap with the link above! Can you chalk paint hardware? Someone asked me if they could chalk paint hardware. 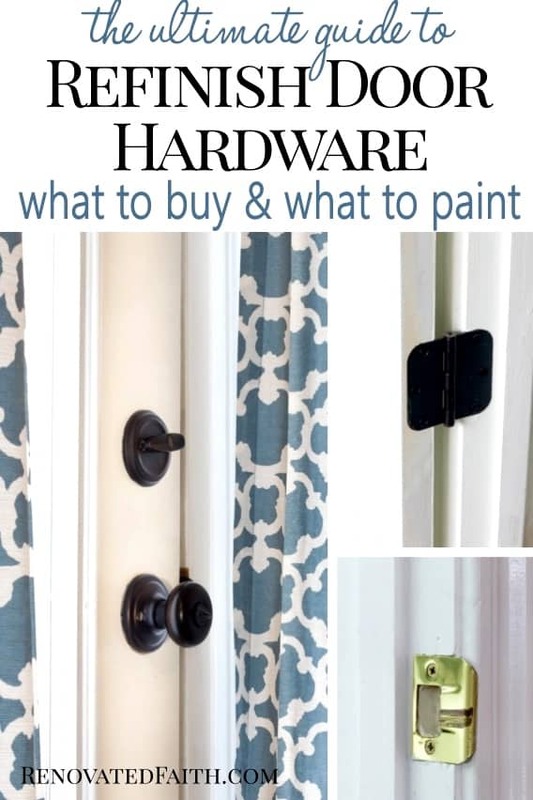 As you may know, I have some strong feelings about chalk paint (grin) but I wouldn’t paint hardware with chalk paint unless it was furniture knobs that you cleaned well, before chalk painting. Then spray paint the cabinet knobs with a clear matte sealant. 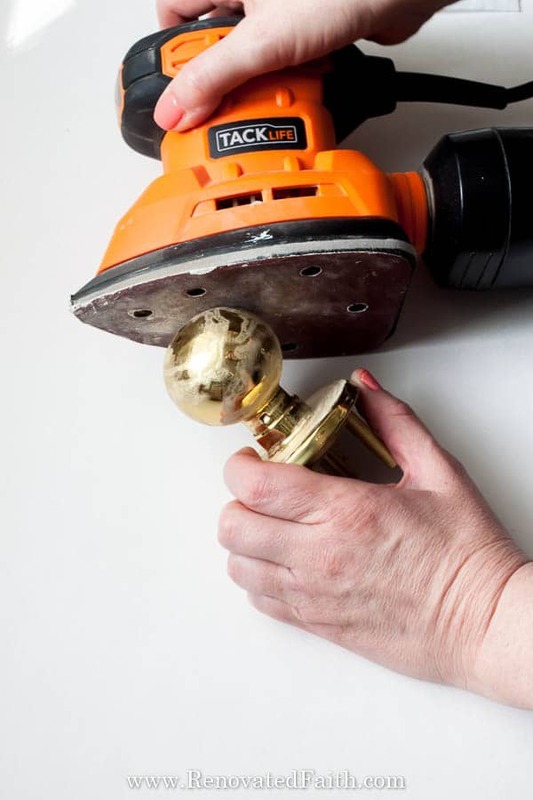 Can you spray paint exterior door knobs without removing them? I wouldn’t spray paint interior door knobs without removing them. But for exterior doors, as long as you taped over and covered all of the surrounding area (and I mean all of it), I don’t see why you couldn’t spray paint exterior door knobs or handles without removing them from the door. This week, I’ve thought a lot about my blog’s purpose and audience. When I started this journey of blogging, I had every intention of being a faith blog with an occasional DIY or home decor post to keep things interesting. However, I realized that what energized me the most and what made my heart the happiest was the DIY posts. With these projects, I could be creative, work with my hands and help people by finding a better way to improve some aspect of their home. I felt some false guilt about this. Part of me felt like a sell-out for no longer doing posts with only devotional content. I realized that this little blog was not only the documentation of DIY and home decor projects, but it was a way to help people by showing them God can transform ANY life circumstance. In the same way you take a curb-side find and restore it into a beautiful showpiece with new purpose and new life, God can repair and renew you and me. So whether you are cleaning up spit-up, teaching middle schoolers, caring for your elderly parents or spray painting door knobs, know that the God of all creation takes pleasure in watching you use your gifts and calling to serve Him. He has not forgotten about you. And He sees you, my friend. He knows you and takes delight in watching His children enjoy the very gifts He gave them. My Jake likes how they turned out too! If you like this post, you might also like my post on How to Decorate Your Home with God’s Word. Just click the pin of the navy door below. 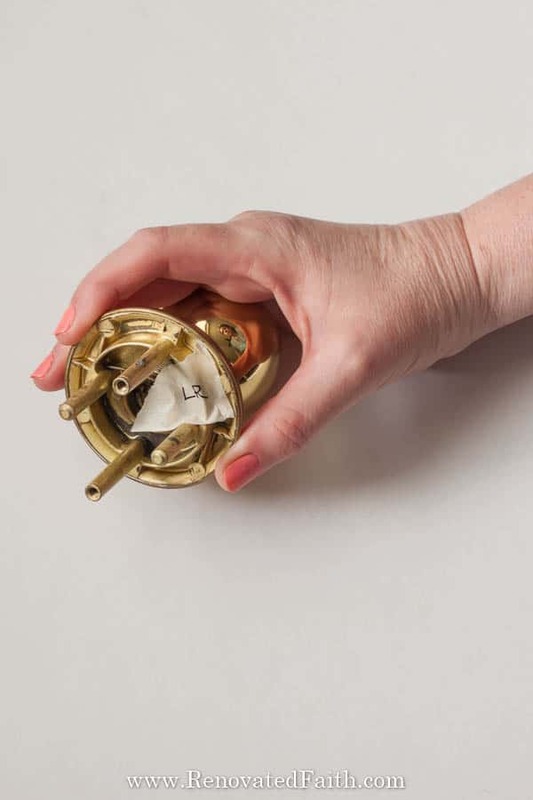 Now that you know the best process to ensure your hardware finish outlasts your house, go grab a screwdriver and start removing those old brass doorknobs! 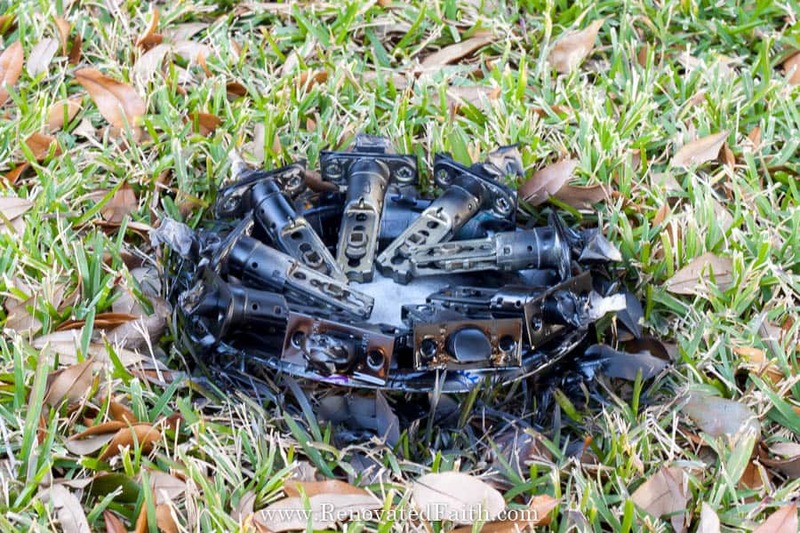 If you aren’t used to spray painting, I have good news! 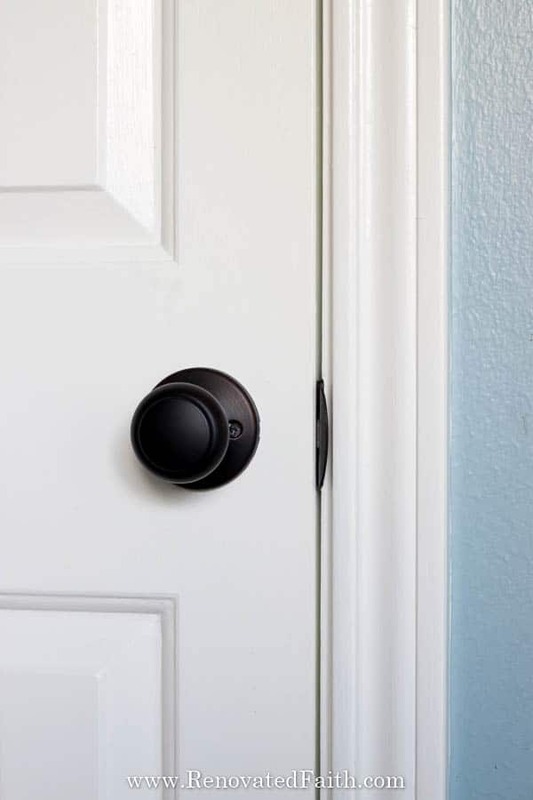 Rustoleum’s Oil Rubbed Bronze is the EASIEST I’ve ever worked with and it is perfect for spray painting your door knobs. You can not mess up the finish! Don’t they look amazing?!? Mr. Faith was impressed with how they update the look of the whole house! This is one of the projects I am looking forward to doing most this spring! All of our handles and hinges are brass and I am so excited to changing that. Though currently my plan of action includes a clear topcoat because I have kids and want the extra layer of peotection. Thanks for all the tips and pictures! Thank you so much for your comment Lanae. I have put this off for SO long and it really wasn’t nearly as bad as I thought. Yes, and a clear coat of top coat will definitely not hurt! Thank you again!! !